If players are unable to select availability please see Warren or Dave to resolve. New game added to the schedule page to mark availability. The game previously scheduled for 23rd Nov will now be played on Saturday 16th November, at Westminster's request. The game will face off at 5pm in Ally Pally. Fantastic news Scrivs - if not a little early! Hope the little one and mum are doing well. Congrats! With the briefest of off seasons we are back! Season 9 - 2012/2013 - begins for the Madness this Sunday. Training will start this Sunday 7th October at the now usual time of 20:15 (or asap allowing for the Dynamos v Romford game beforehand). We will be changing in the changing room that used to be the officials room. We are always interested in seeing new players and are open for people joining who have never played before however we would ask that you contact Dave or Warren before to confirm attendance. New players will require the following: £50 for EIHA Rec Registions, a completed registration form (will have on the night) and a photocopy of either driving license or passport. First night is free and if you don't want to continue registration we will return the £50. Let's have a good season Madness! Madness are in the "usual" changing room sharing with Solent Scorpions. Updates will appear on the site and on our Twitter stream (@MedwayMadness) across the weekend. This Tournament is to be played to Tournament rules; which include no icing and running clock games of ~14 minutes duration. There is a 15 Team maximum entry; and now the 15 places are filled, the two next teams to apply will become Stand-by's and informed as such. Should a team pull out, these teams will have the chance to fill in, in the order of their application being received. Teams are limited to a maximum Roster of 20 players (inc. Netminders) and all must be 18 or over on the 18th July 2012. Rosters must be submitted in the format requested. We hope that all teams that take part have an enjoyable Weekend, and we will see you there. I know a few of you, like me, have broken a stick or two over the past couple of weeks so have a quick look at Ride's stock.. Some decent lumber in there for a score. Helped myself to two this weekend! For £20, get a spare one in your bag. Already on to that one Tony! Also, as ever, the Competition will be Full Checking hockey, played to Tournament rules; which include no icing and running clock games of 14 minutes duration. Teams are limited to a maximum Roster of 20 players (inc. Netminders) and all must be 18 or over on the 30th June 2012. Training on Sunday 13th May will be at the earlier time of 16:30 on ice. This is due to there being no other sessions on that day. If no one else takes the 4-8 slot we may potentially train at this time for the rest of May. Please let others know. I'll take a pair of the socks Rats, always need them..
Good work by the lads then and you can't win them all, hopefully they get something out of the defeat for future games. The Medway Madness would like to wish all players and their families, supporters, followers and generally any passerby to this site a very merry Christmas and all the best for 2012. The Madness will again be competing in the Southern Conference against Slough, Guildford, Bracknell and Solent so plenty of action on the ice. Keep an eye the fixture pages for the next game! Unfortunately due to a significant increase in spam attacks and posts that are not in line with Madness rules we have suspended the ability for any new users to post or reply to threads. If you are a genuine user looking to join our site please contact Warren or Dave T who will enable your profile. Apologies if this causes any inconvenience to genuine users. Dougie - If you can get an extra copy (as I am in London all day today) I'll try to scan and get on the front page of the site. Amazing job, and another Madness netminder stepping up. Good work Lee! I've always said you were half the man I am..
Ok, so I ordered the wrong bloody size! I knew full well I didn't want a UK size 12 but apprently I ordered them anyway. I'll let you have 24 hours to get the necessary urine extraction in. Meanwhile, I now have a mint pair of Bauer X60s, uk size 12, for sale. These are unbaked and not sharpened but without box. You'll struggle to get these skates anywhere and certainly not for the £300 I am looking for. Not looking to make money on these but just want to get my money back so I can reinvest quickly whilst Damon is in the US. Please let anyone else know who has feet like a canoe. 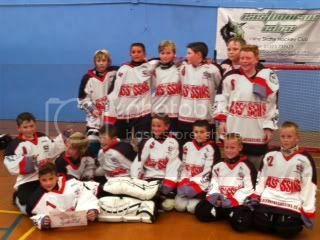 Medway Assassins, a junior roller hockey affiliate of the Madness, competed today in their first tournament in Eastbourne and earnt a very respectable 2nd place. The boys turned in wins in their first two games against Brighton Stormers (5-3) and Hastings (9-2). Their final game saw a close loss to Eastbourne 3-1. Playing Eastbourne again in the final the Assassins were unable to find a way to beat the experienced competition and narrowly went down 2-1.